Been trying the FreeBSD 9.0 release candidate for several days now, and I've been absolutely blown away. When I first read on the mailing lists that sysinstall was to be replaced with something else, I'll admit I was a little terrified. In a world of overly complex, flaky and resource heavy graphical installation tools, sysinstall was visually unappealing but it got the job done even on modest hardware. I'd seen some screenshots of a FreeBSD graphical installer, and like the curmudgeon I am, I took a disliking. Fortunately, the bsdinstall system that has replaced it assuaged all my fears. In a word, it's beautiful. Simple, clean, elegant, quintessentially BSD. That was more than one word, forgive me I couldn't resist. As someone who also dabbles in NetBSD from time to time, it's my opinion FreeBSD finally has an installer equally as nice. Visually, the navigation is clearer and the screens more logically laid out. For someone coming from Linux the lack of a graphical install may seem jarring, but I'd argue the new installer is just as easy to use — perhaps a little moreso — than any I've used on Linux. The new Guided Partition Editor is a pleasure to use even if you're not a beginner, for one primary reason that rhymes with "kernel" and "blurnal". Wait, that's not a word. If you've ever done that hack of setting up multiple swap partitions so you can reboot and create gjournals, the installer now lets you define softupdates as well as softupdate journals (UFS SU+J which has made its appearance in FreeBSD 9, more on that in a future post). 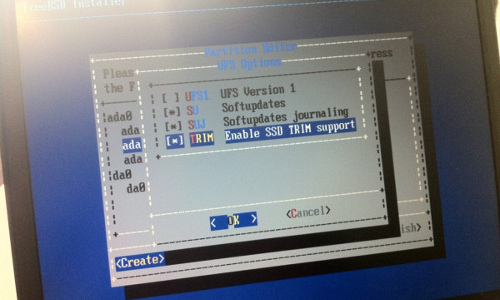 TRIM support is also built in and selectable from the installer now. As I said on Twitter, I jumped up and started dancing! I also haven't had time to check this out yet, but this one line in the BSDInstall manpage made my jaw drop. Sets up a new chroot system at destination, suitable for use with jail(8). Behavior is generally similar to auto, except that disk partitioning and network setup are skipped and a kernel is not installed into the new system. For those who are unaware, jails are one of the most wonderful and elegant features of FreeBSD, and the #1 thing I miss when I use Linux. I run my torrent client, web server and file servers in their own jails on my headless server, they're infinitely simpler to set up and maintain than VMs and provide excellent security. Now they'll be even simpler! FreeBSD is a beautiful operating system, and with the addition of this new installer, I'm hoping more people will give it a try :). Stay tuned for more commentary and fun with FreeBSD 9. As I said on Twitter, I haven't been this excited by a FreeBSD release in a long while. I might even give it a try on my ThinkPad again, given the latest release of Fedora broke my graphics.